There were 5 posts published in August 2012 (this is page 2 of 2). 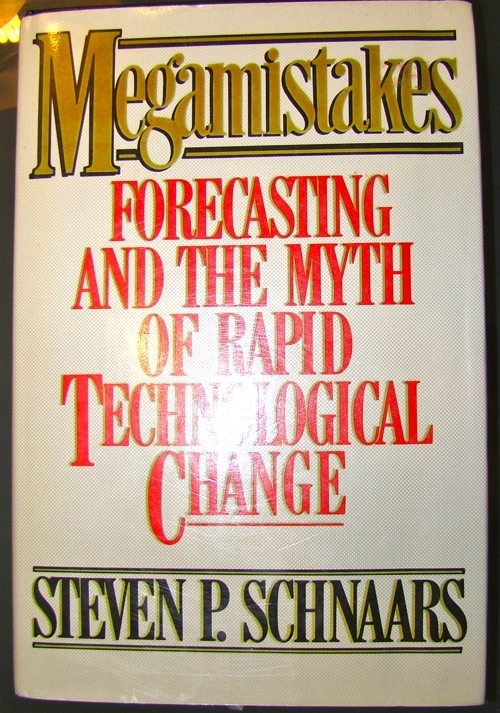 Megamistakes was published in 1989 – so, it’s especially interesting to look at a book about forecasting which is over 20 years old. Most of this article will be quotes of the book. Enjoy! The most prominent reason why technological forecasts have failed is that the people who made them have been seduced by technological wonder. The forecasters who construct them are blinded by their emotions and lose perspective of commonsense economic considerations. A key premise of forecasting is that a passionate focus on technology for its own sake spells disaster. No doubt, many of the same errors are being repeated today. How much I love these three sentences. Year and year again we see some people praising some new technology to be the “next big thing”, “bigger than the internet” or whatever and a few years later nobody remembers about that technology. A common technological trap. I thought for the most part of my life that technology can solve practically every problem. But if you look deeper, the problem is often psychological or cultural. Today, we see that lots of young people don’t necessarily need a car – forty years ago this was unthinkable. Computer forecasts are exceptional in this regard. IT is one of very few industries where optimism was warranted. This is really exceptional. Even the overoptimistic forecasts became true. The method did not matter. Asking the right questions did. Nuclear ships had no effect on the industry. Lower-cost international competitors did. This was a common theme in the last decades. Especially, in the US people thought about technology but neglected international developments. Look at the flight industry. Flights didn’t really got cheaper because Boeing developed an innovate air plane. It got cheaper because of deregulation and lower barriers to entry. It is good advice to be skeptical of any forecast that calls for a new age. If you exclude computers then not so much has changed in the last 10 – 20 years. We pretty much life in the same houses, shower in the same shower, eat practically the same food (also people buy much more organic today). Cars haven’t really changed – the most change came through computers. Things like notebooks, smart phones, car navigation systems, etc. In 1987 Tyzoon Tyebjee conducted some experiments on biases in new product forecasting. […] He found that the very act of participating in the new product planning process led to overly optimistic forecasts. This is an interesting result for especially for technology startups, or more so for investors. Later there’s more about demographic forecasting and it works pretty well. There is absolutely no evidence that complicated mathematical models provide more accurate forecasts than much simpler models that incorporate intuitively pleasing rules of thumb. In growth market forecasting it seems less important whether the model is fancy or not than whether the model incorporates the right assumptions. In the excellent book Forecasting (a newer version is freely available) they basically came to the same result. Often simple methods like exponential smoothing work better than highly complicated models. In a 1985 article in Management Science, Everette Gardner and Ed McKenzie proposed a simple mathematical model that incorporates a “damped” trend. […] They and others, including myself, have tested their model in many different types of applications. Almost universally, it has been found to be more accurate. And dampend trends work even better. You can read more about them int he same book as above for free: 7/4 Damped trend methods. A central thesis of diffusion of innovation is that some initial group of customers purchase new products. They are called the innovators. […] After a while, a second group of customers, opinion leaders, enters the market. Rapid market growth ensues as many other consumers imitate the purchases of these respected members of society. […] Then growth slows, as nearly everyone is using the product. The problem with using research arising out of the diffusion of innovations, the product life cycle, and market growth curves is that they ignore the fact that market growth is not guaranteed, or even likely. Like the quote says the big problem is that the diffusion of innovation models only explains successful products, so it’s not of much use pre-success. The Zeitgeist concept is used to explain the fact that inventions and discoveries tend to be made simultaneously by researchers working independently. Consequently, the Zeitgeist means that inventions and discoveries are due less to the power of individual genius than to the spirit of the times. The Zeitgeist also casts doubts on the merits of consensus forecasts. It implies that a consensus forecast is not difficult to obtain, but that the consensus may be more indicative of present beliefs than of actual future outcomes. We’ve seen a lot of inventions happen simultaneously. Schnaars also notes that not only inventions are covered under the Zeitgeist concept but also forecasts. It’s interesting that each decade had its own Zeigeist and the forecasts mirrored it dramatically. Even Schnaars himself contributes to this by emphasizing the industrial strength of Japan and other non-US countries which was a big topic in the mid-late 80’s. Cars would also move into the jet age. All three American automakers spent heavily on turbine cars using jet technology. The transfer of technology from airplanes to autos failed to generate a growth market. It was an impractical idea. All in a setting where children wanted to grow up to be astronauts rather than computer wizards. People were fascinated by space travel. Imagine yourself in the late 1970s forecasting that energy prices would decline throughout the 1980s. For one, it never would have happened. Such a forecast would have been preposterous at the time. All the indicators of the day pointed to ever higher oil prices. Some even talked of the end of the petroleum age. Even if you had made the forecast, who would have believed it? It was inconsistent with the beliefs of the day. The last two sentences are insightful. It’s hard to argue against the general belief. In science, there’s the observation that beliefs don’t die, but the people having them. It’s probably the same for normal people. In 10 or 20 years we will look back and saw some stupid belief we have today. * What additional benefit does this product offer over existing entries? * Will consumers have to, and be willing to, pay extra for it? * Does the product offer a benefit over existing products that justifies a higher price? This will filter out easily half of the promising technologies. In this book, Schnaars applies these three questions to a lot of different technologies, like moving side walks and video conferencing. Predicting social trends is one of the most difficult forecasts to make. Social trends involve people, who, unlike physical quantities, do not behave according to physical laws. In the permissive 1960s, for example, who would have predicated that a conservative President would be overwhelmingly elected in 1980? Radical college students in the 1960s saw a revolution in this country as a real possibility. In the 1980s, those same persons flocked to business schools and coveted highly paid careers in investment banking. Demographic forecasts that sought to predict birthrates and other events that had not yet occurred often proved mistaken. There are two different things here. Forecast of social trends and demographic forecasts. Social trends are extremely hard and probably more random than most of the things. Demographic forecasts, however, can be rather accurate if they people are actually born, yet. For example, in 1960 Business Week analyzed census data and concluded: “During the next twenty years the number of Americans over 75 will increase to 9 million.” This forecast of the elderly segment of the population proved close to perfect. The 1980 Census counted 8.94 million persons over the age of seventy-five. However, a problem is if you assume demographic and cultural forecasts behave identically. Forecasts are particularly vulnerable when they assume that a growth market will result when a large group of consumers enters the primary age for heavy demand of a product category. Such forecasts assume that the younger group will follow the pattern set by its parents. Like Elster said, either the young will do the same as the parents or something different. Don’t assume that younger people will do the same as their parents. This is one example. There were a people who foresaw the 2008 financial crises and there were a ton of people who questioned the sustainability of Groupon. Surprisingly, firms holding a commanding share of their market are often among the last to foresee potential threats to their bread-and-butter products. As a result, market leaders often miss the opportunities that they themselves should have created. Remarkably, time and time again, in industry after industry, market opportunities have been more apparent to outsiders than to those with a dominant position in the industry. We see this time and time, again. Schnaars describes one of the slide rule manufacturers. A giant – then came the micro chip and they though that this doesn’t really influence their market. A decade later they shrunk into a small business. A similar thing happened to IBM where they declined the possibility of creating (enterprise) software, etc. etc. Will the new technology offer them a real benefit over existing and subsequent substitutes? Is the technology cost-effective relative to those substitutes? Is the derived benefit worth the price you will have to charge? Are social trends moving toward or away from this market? Does the innovation require users to do things differently? Does the innovation go against customs, culture, or established business practices? Such an awesome book. I really loved reading Megamistakes. It’s full of insights. Schnaars shows different forecasts from different time periods. It’s astonishing how strong the Zeigeist influenced their forecasts. Furthermore, a lot of time he quotes other forecasters and their experiences. And you can get a used copy for under $5. It’s a fantastic book and should be read by nearly everyone! Recommendation!